We always had bird feeders growing up, but it was a general interest for me and not something I really explored in great depth. I knew what a cardinal was and a goldfinch, but that was pretty much it. My husband, however, grew up in a family of birdwatchers — his parents talk about going to spots to watch birds on their first dates and my husband always had and used binoculars growing up. They even named him ‘Martin’ for the Purple Martin. When I met my husband he was actually working for an optics company that specialized in outfitting birdwatchers. On one of our first dates, we went for a hike in a local arboretum and he called out a Barred Owl — the first I’d ever seen. I didn’t know if I should be more impressed by the bird or the fact that this guy I was standing with in the woods just imitated an owl call with some serious skill. I asked him where he learned to do that and he responded, “When you spend enough time alone in the woods you learn to make a lot of weird sounds” or something like that. I was pretty sure in this moment that my life was going to be interesting. Fast forward a couple years and we’d gotten married and I was a full-fledged bird nerd. We’d taken our honeymoon to southern Texas where I accumulated an obscene amount of ‘life birds’ and just learned a ton about them. At some point in the following years, my husband got his parents a martin house for their yard as they love their bird houses and feeders. A common topic of conversation in spring is always when certain birds return for the summer and at some point we learned that it was no longer ‘the Martins are back’, but ‘the Martins and Sarahs are back’ — of course, referring to the male & female Martins. I realize I’m biased, but I think that’s the cutest, sweetest thing. 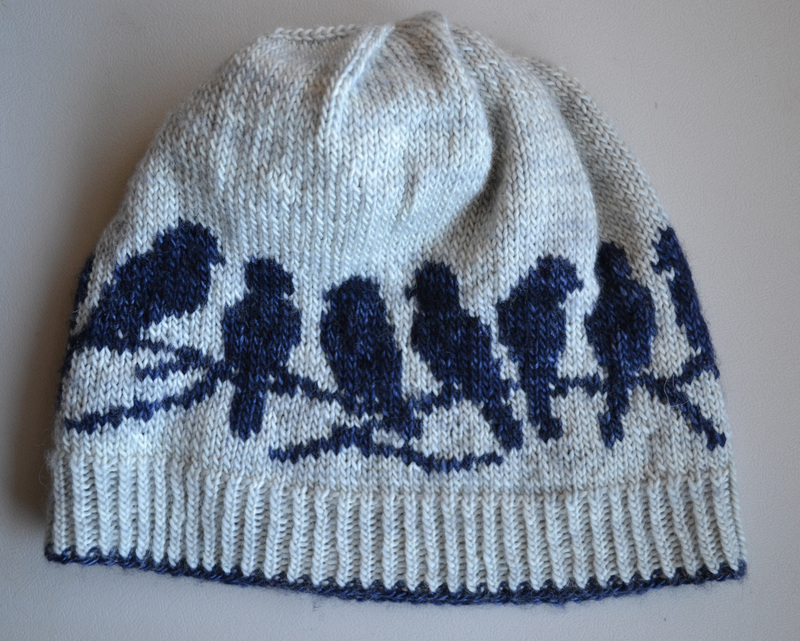 You can bet that when Erica Heusser released her Passerine Hat last November this hat simply had to be on my needles. When I saw the purple-y blue Ink colorway in Madelinetosh’s Unicorn Tails, I knew that this hat was destined to be ‘Martins and Sarahs’. There just was no question. I immediately picked up enough Ink & Silver Fox Unicorn Tails to make the hat. And as things go, it sat for a couple months while I tended to other projects. And the next morning I frogged back to the brim. 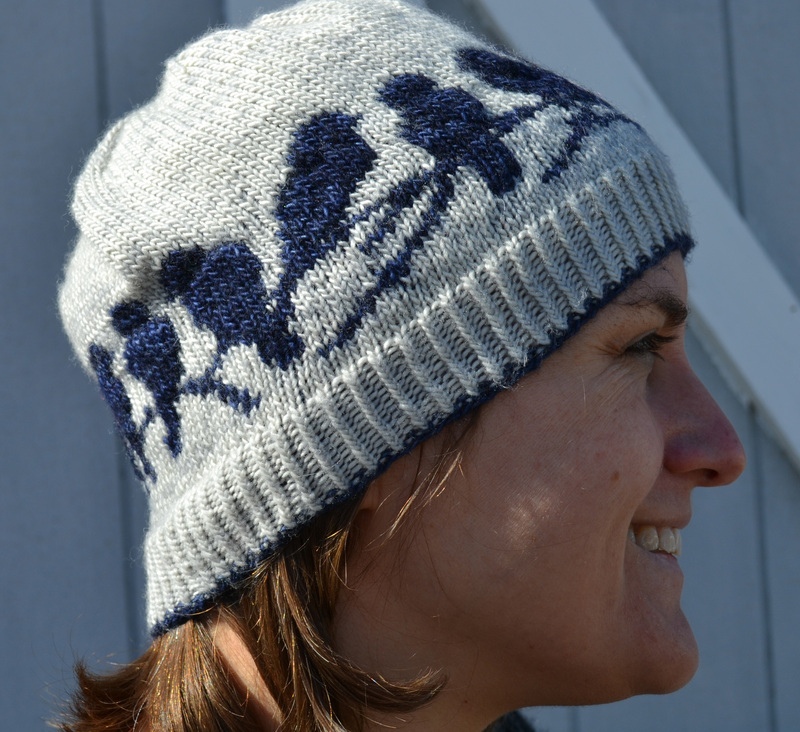 This hat is what I would classify as an intermediate colorwork project as you are required to control some longer floats. 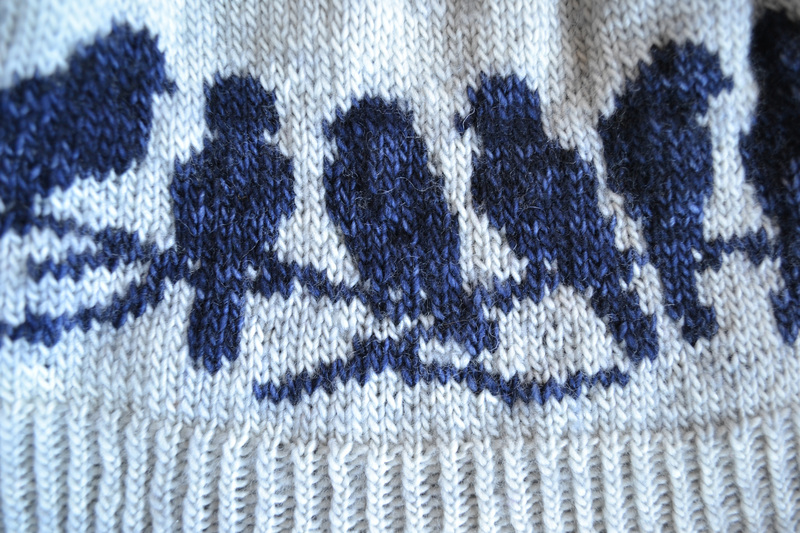 It’s not what I’d call hard, but it’s definitely a skill builder for anyone new to colorwork. 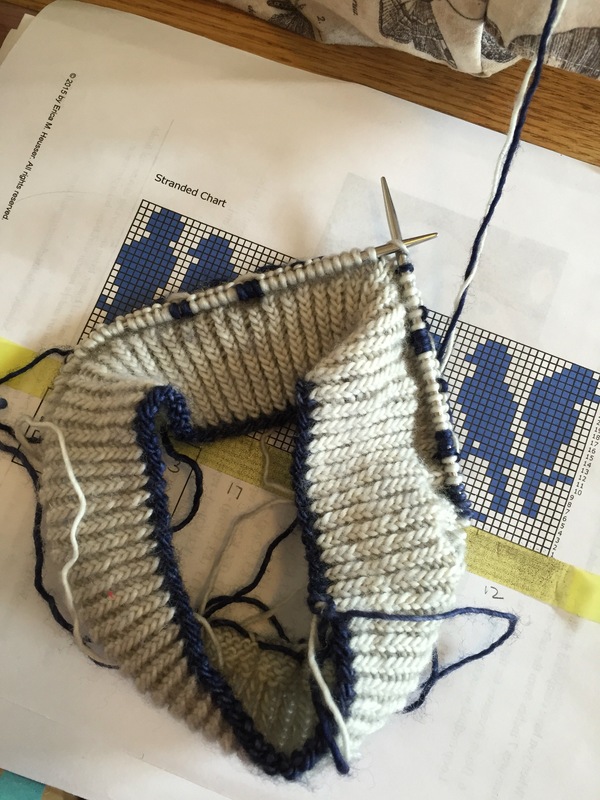 For those — like me — who are pretty well-versed in colorwork, it doesn’t hurt to take your time either. Obviously! By the following day, I’d finished (again) and this time for good. It was worth it as my Martins and Sarahs are now perfect in every way. And now I have the cutest, sweetest hat just in time for Spring migration, just in time for the Martins and Sarahs’ return. I’m pretty sure this brings me to a new level of nerdom awesomeness. I guess when you spend a lot of time in the woods with the person you love, you learn to make some weird sounds and adorable hats. That is by far the best first date ever! How wonderful! We are the opposite here, my husband knew nothing about birds (other than how to hunt them) and I grew up with a mega birding father from South Texas. We birded so much in Matagorda County TX when I was a child, I’m sure my life list would be massive if I had actually been keeping one then. Such sweet stories you have with your Martin, Sarah. I love the cap, of course, and now whenever I spot a Purple Martin (not an easy feat in Iowa, unfortunately) I will absolutely think of you & your guy! Fantastic post! Thank you so much! It was such a fun story to tell! I should have also shared that it also included a bread, cheese, & wine picnic. I’m a huge fan of picnics and that detail was very exciting to me, but it seemed a bit of a tangent when I was writing — lol! It’s so incredible that you got to bird in Matagorda County a lot as a kid! For our honeymoon we flew into San Antonio, rented a car and saw as much as we could — Aransas NWR, Corpus Christi, South Padre Island, Laguna Atascosa, Harlingen, Brownsville, Santa Ana WR — we covered a lot of miles. We even made it back up to Austin to see the bats! We’re really hoping to get back to Southern Texas with the kids soon. We were worried about the long drive, but after Yellowstone it seems within our reach. The main question now is when during the year we want to schedule it and whether we want to camp or do hotels or a rental. As I knew it would be, it’s always a new and interesting adventure! Love those peacocks on the cap. Very cool! That is a wonderful story and your in-laws are by far some of the cutest with the Martin and Sarah’s comment. The hat looks darling and perfect for the spring season. I agree! My in-laws are awesome. 🙂 Thanks for your kind words! “Weird sounds and adorable hats” love it!!! 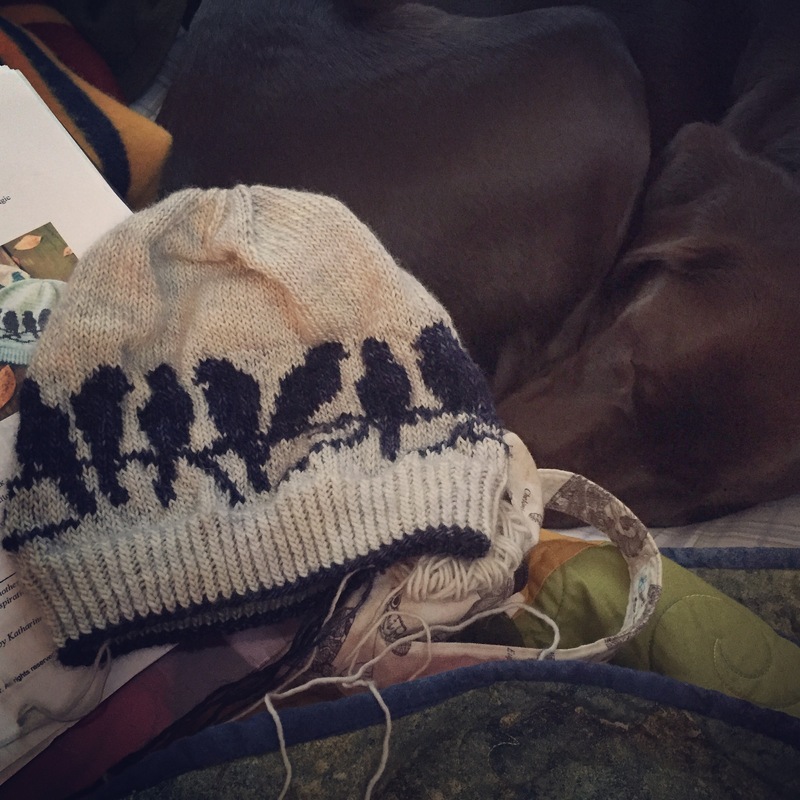 Great story and super cute hat! What a wonderful story. My husband loves purple martins and I bought a “gee-whiz” martin house for him. We have a great location and have it set up correctly, but have yet to get martins – only starlings we have to run out. 😦 LOVE the hat. I want to try color work and will work my way up to it! I would definitely class this colorwork project as intermediate, just because you do have to tack a fair number of floats. I think working up to this is a good idea — I would start with a more regular pattern where the floats take care of themselves and then ‘graduate’ up to one like this. Totally agree that working up to it is the answer. 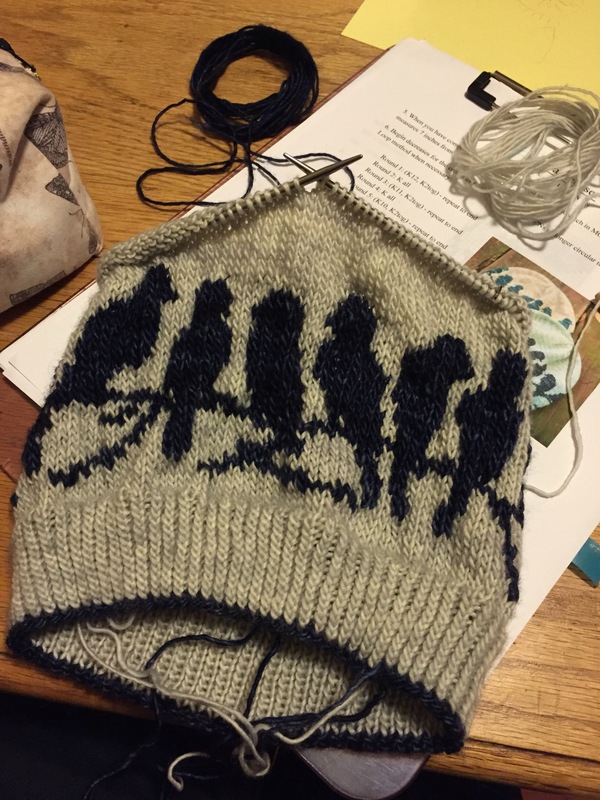 While I’m a pretty strong intermediate knitter, haven’t done any color work, except for striping, alternating, mosaic, brioche (your Brioche-Along that is a blast! ), but none of those has serious floats. In my future, though – maybe another ‘Along’??? Thanks for sharing your family and your knowledge! Yes, stranded colorwork is kind of unique in the knitting world just in that the tensioning does take a little getting used to. It’s the only technique that I always advise taking in steps, regardless of a knitter’s skill level. An exceptional knitter such as yourself could probably work some swatches in the round instead of a whole project, but there are enough fun beginner colorwork projects that’s it probably more fun to just go that route. I can’t wait to see how you like it! Thanks, Mary Ann! This was certainly a fun story to tell!